5 ways to use SEO and Paid search together to get better result. Paid search and SEO both are great way to get visitors to your websites, however both works in a different way. Paid search can almost grab the result immediately, but cost more. While, SEO is more likely to cost free, however, optimization process and efforts can take long time to deliver a result and take time to get impact on ranking. Both are equally important for online marketing and depends upon your time and priorities to use them. Few years back, these methods have been used separately, however, the days are changed and now, most of the businesses are using these tactics because they see the values and both are vice versa. Google updating their algorithm to shift the industry in a new direction, and the organic search query information become limited, the reason google does that is to increase privacy. Thus, the important of using paid search along with SEO is more important now a day. While, SEO and paid search both are dependent on keywords, with keep that in mind, both disciplines should have looked at same view. 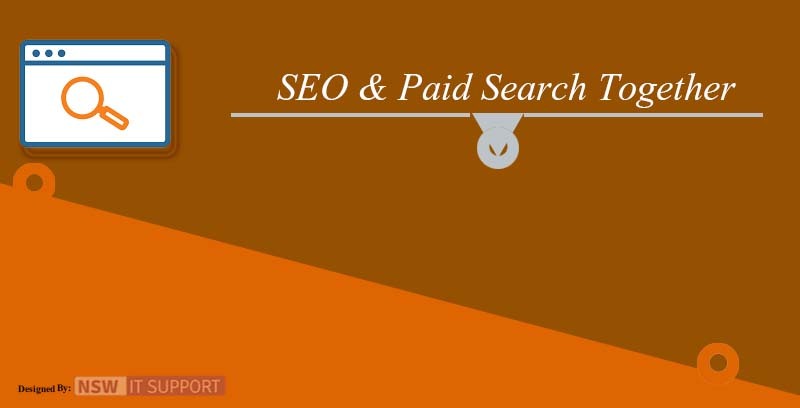 Here are some ways, we have explained about integrating paid search and SEO that can be use by any businesses. You have an option of Google Analytics and Google Webmaster Tools (They changed the name to Google Search Console) to check for what keywords, you are getting visitors to your websites. The keywords can be used to run your paid search campaign, if they aren’t used yet for paid search. The best way to check your keywords traffic volume is using Google AdWords Tool, you can determine is the keyword you are using for paid search getting traffic that worth the cost you spend. Now, look at your content within your website, do you have related content or webpage for that high converting keyword? If no, please add some, because this is the way to integrate your paid search with SEO, there is more chance to have organic result for your keywords by using in your content and same for paid search. Surveys and studies have shown us that the users are more likely to click on your paid links if they also see your organic result on top. It’s a 50-50 situation, however if your keywords are not ranked in top 3 position in SERP, then it’s a bit difficult to get clicks and if you are not in first page, you probably have no clicks. So, what I am trying to say is, if you have any keywords in top 3 position in SERP, then don’t leave your visitors on the table, because 50% of the click you missed if you do not run paid search campaign for your organic ranked keyword. Don’t leave your chances to get more clicks and to do that, take your best working ads by checking the click thru rate and conversion rate. Now, try to add those data inside your meta description and title, for example, headline for title and ad copy for meta description. Plus, you can also check high preforming webpages and try that within paid ads. In Search Engine Optimization, content is king, and it always does. So, before diving into content writing, please have a try with some paid search. You can try for certain topics, keywords or anything you are going to write about later. If the conversion rate for those topics or keywords are great in paid search, that means you are in right track, however, if it doesn’t then you better look for some other topics. Because, most of the time, if the paid search doesn’t perform well that means the topic is worthless and you will not get that much traffic, which will not worth your time for creating content and SEO. By using paid search or pay per click report, you can get idea of your new competitors that you may not have thought them as your competitors. But, trust me, you will be surprised what you will see. I have found many competitors; those are not directly related to my businesses but still I can see them as my competitors. The list of 5 ways that I have mentioned above can help you to improve both your SEO efforts and Paid search. From small scale business to large scale organizations can use these methods, and can make impact profitably & quickly.